Instant Imprints Fredericton, NB | Custom T-Shirts, Embroidery, Signs and More! 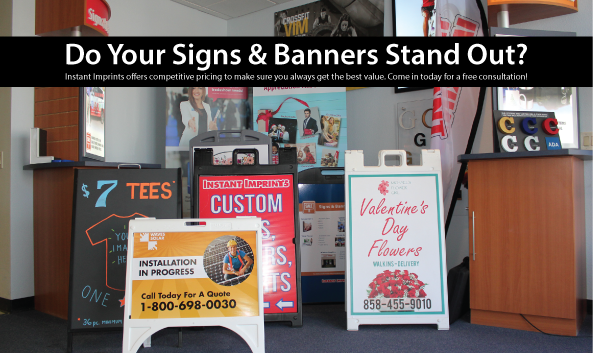 At Instant Imprints in Fredericton, our customers come to us when they want to be more visible to their customers. We create that visibility five different ways: Branded Apparel (embroidery), Signs & Banners, Promotional Products, Custom T-Shirts and Print Services. When you’re looking to bring a greater visibility to your business, create a stronger bond between sports teammates or promote an upcoming event, Instant Imprints in Fredericton has the solutions for you. Our superior custom t-shirts, printing services, promotional products, custom banners and branded embroidery items gives your brand a serious advantage by showing off your logo in style. High-quality promotional goods work to represent your brand in a positive way, and our team of Fredericton Image Experts is ready to help you achieve new promotional heights! If you’re looking for the first-class quality of an industry leader combined with the local attention-to-detail of a New Brunswick Image Expert, Instant Imprints in Fredericton brings you the best of both worlds. The end result is a finished product that is sure to turn heads, wherever it’s seen. At Instant Imprints in Fredericton, we pride ourselves in getting your job done right the first time, and having it delivered when you need it. Just ask your smart speaker, “What’s the best print shop near me?” and you’ll be sure to find us at the top of the list! Custom t-shirts are powerful ways to reach more prospective customers. Whether you’re looking to promote an upcoming event, push a new product or represent your brand as a whole, custom t-shirts give your logo the power to travel the globe. When your employees, teammates or customers sport your custom tees, they’re proudly representing your brand and spreading awareness about your business wherever they go. That’s why it’s important to use only the highest quality custom tees around, which you’ll find exclusively at Instant Imprints in Fredericton. All across Canada, custom signs and banners play a big role in spreading brand awareness. At Instant Imprints, we understand the power of a perfectly crafted custom sign in driving business your way, which is why we work to understand your project needs and deliver a superior finished project. Our Fredericton Image Experts are happy to help you pick the right design options such as materials, colors and fonts to help you stand above the competition. We also supply professional trade show displays so that you can impress your colleagues at your next industry event! When it’s time for your business to enjoy increased brand visibility, stop by our Brookside Drive Showroom, give us a call at (506) 449-0750 or request a quote online to get started today!